Although its existence was denied by the American Medical Association in 1973 (Marilyn Light in her book “Hypoglycemia” (and here), hypoglycemia is now the direct precursor of the epidemic of diabetes – affecting 246 million people worldwide – possibly responsible for various degenerative diseases, obesity, and a soaring rate of mental illness and clinical depression. (82 JOM studies). Hypoglycemia is the precursor to full blown diabetes, which could take about 20 years. Hypoglycemia means low blood sugar level, although “unstable blood sugar levels” would have been more fitting. This is truly a silent disease (like diabetes), since most people would not be aware of having it. This term is used to describe a metabolic disorder, that may manifest itself in a variety of physical and ‘psychological’ symptoms. One must understand that glucose is a source of both physical (muscle) and mental (brain) energy. The brain, representing only 2 percent by weight of the body, has no energy stores of its own. It requires about 60 per cent percent of the all available glucose in the body and consumes about 120 grams per days regardless of whether we are asleep or awake (Source). About one teaspoon of glucose is available in the blood at any time. Most doctors believe that hypoglycemia is due to “insulin resistance”, which it shares with diabetes. see Robyn Cosford (1). It is estimated that in 2005-8 about 35 percent of US adult had pre-diabetes. See Research Evidence. See: for causes. Premenstrual Tension, Bedwetting and hyperactivity in children. For studies showing the connection between hypoglycemia and mood disorders: ➜ References for Mood Disorders and Nutrition. As will be clear later on, hypoglycemia, or low blood sugar level, is only one form of what Dr. George Samra in his book THE HYPOGLYCEMIC CONNECTION II 2 describes as The Hypoglycemic Syndrome. He refers to the four most important symptoms: 1) Depression or moodiness, 2) tiredness, 3) memory impairment or poor concentration, and 4) history of sugar addiction. At least three of the symptoms should indicate the possibility of hypoglycemic syndrome. The blood sugar level is controlled by the pancreas by means of two hormones; 1) insulin, which pushes blood glucose into body cells and so lowers the blood sugar level, and 2) glucagon, which slowly raises the blood sugar level if it falls too low. Another hormone involved is adrenaline produced by the adrenal glands which may quickly raise blood sugar level in response to a crisis. (See image) When there is a overproduction of insulin, as is the case in hypoglycemia, the brain will be starved of its source of energy – glucose. The proper test for hypoglycemia is a special Glucose Tolerance Test (GTT) designed by Dr George Samra and described in his book The Hypoglycemic Connection II. See Hypoglycemic Test. See also below. Unlike a test for diabetes, Samra’s GTT records the measurements of glucose levels after a load of glucose over time, usually over four hours taken each half hour. He is interested in the rate of variations – the rise and fall of blood glucose during the test. 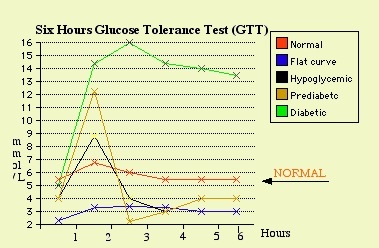 This enables the doctor to discern six types of hypoglycemic reactions in a GTT as described in his book. This test should not be confused with a test for diabetes (a single blood test) which is different from a full GTT. You can also test yourself with a paper-and-pencil test for hypoglycemia with the NBI. Another useful test is: The Hypoglycemia Questionnaire. Type 1, Relative Hypoglycemia. Following ingestion of glucose the blood sugar level rises unusually high (due to insulin resistance) and then suddenly drops. The rate of descent should be over 2.6mm/L (45 mg/100mL) in any hour, or over 1.6mm/l (30mg/100mL) in any 1/2 hour. Vitamin B1 plays a role in the production of thyroxin, as does phenylalanine and tyrosine (the latter is the immediate forerunner of thyroxin). Thyroxin is also needed in the conversion of beta-carotene to vitamin A. Iodine deficiency may also be a factor in hypothyroidism. Also look up Hypothyroidism in Index. Type 6, Cellular Level Hypoglycemia (Hypoglycia) This is energy starvation at the level of brain cells. Here, the person may have a normal GTT but presents the same hypoglycemic symptoms. This may be caused by a dysfunction in enzymes involved with glucose metabolism, usually as a result of an abnormal zinc/copper ratio or other type of heavy metal toxicity. Zinc is a coenzyme in the breakdown of glucose to simpler biochemical substances, before being used as energy inside brain cells. High copper levels depress zinc levels and vice versa. See also Hypoglycia Notes. 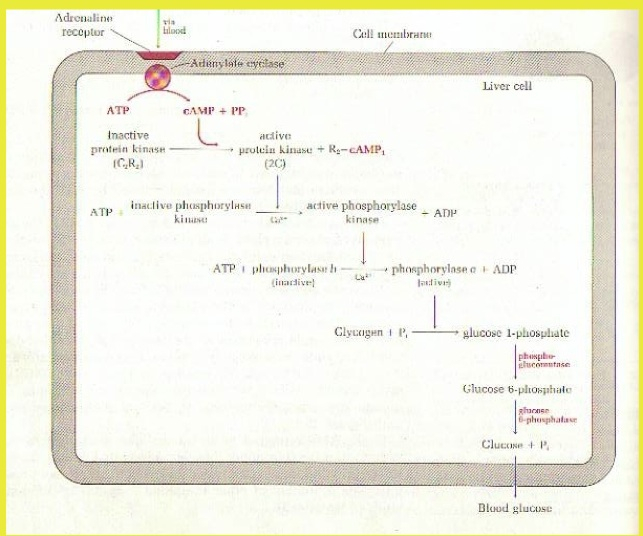 Other coenzymes and vitamins are also involved in glucose metabolism inside the mitochondria. See results at: Image. If you want to compare with mg/100mL, multiply by 18. For normal and Diabetic Blood Sugar levels see here. ALLERGIES are closely related to the hypoglycemic syndrome. Many asthmatics have improved their condition by adopting the hypoglycemic diet to be discussed later. Very often, when we adopt the hypoglycemic diet – by eating natural food – hitherto hidden allergies may emerge. Common foods, causing allergic reactions are cows milk, eggs, fish, crustaceans, legumes, grains and various seeds. These may all result in hypoglycemic symptoms. Food allergies often interfere with the proper absorption of nutrients in the intestines, thus causing vitamin and mineral deficiencies. Others obstruct the synthesis of neurotransmitters in the brain (such as serotonin), often resulting in ‘psychiatric’ disorders. Allergic reactions can be overcome by either avoiding the offending foods and/or by supplementation with special enzymes, vitamins and minerals. Depending on the severity of allergic reactions, these should be treated in consultation with professional nutritionists. Other factors that may be responsible for allergic reactions may be the Leaky Gut Syndrome, or liver dysfunction. See also Samra, Dr G. The Allergy Connection. 3 Coffee (caffeine) and cigarettes (nicotine) – and allergens – stimulate adrenaline production, which raise the blood sugar level by converting glycogen back into glucose. This provides a ‘high’ to hypoglycemics, who are then often addicted to these substances.This explains why we may be addicted to our allergies. Food, drug and allergy addiction – and even hypoglycemia – over a long period of time may cause adrenal exhaustion, as the body has relied on adrenaline production to raise the blood sugar level. Adrenaline is a defence hormone against all forms of stress. 1) Avoidance of sugar, coffee, strong tea, nicotine if possible, refined carbohydrates, such as white bread, white rice, cakes and sugary drinks etc. 2) High protein + complex carbohydrates snacks every three hours or sooner, to provide a slow release of glucose, and to prevent the hypoglycemic dip. A high protein breakfast must be considered the most important meal of the day. Good sources of proteins are eggs, white meat as in chicken and fish. Eat plenty of green vegetables and fruits and the more varied the diet the better it is. 3) Supplementation of diet with Anti-stress vitamin B-Complex tablets, including chromium, zinc + Vitamin C, Omega-3 fatty acids (Fishoil), B12 and folic acid, vitamin D. See also Hypoglycemic diet. A rule of thumb is: “Is what you are about to eat nature-made or man-made?” Nature-made food consists usually of complex carbo-hydrates and proteins, the kind of food that we were meant to eat. There are exceptions, such as sugary fruits; melons, honey, dates and bananas. But see here. These can be re-introduced into the diet after some time in moderation. When you change your diet suddenly, you may be left with low blood sugar levels, without the highs, causing depression, fatigue and worsening the symptoms initially. These are withdrawal symptoms, that should not last longer than a week or so. Nevertheless, these unpleasant feelings can be alleviated, by taking a tablespoon of glycerine mixed in milk or diluted natural fruit juice or better still in a glass of water three times a day. When glycerine is metabolised into “energy” in the liver, it by-passes glucose, and is therefore not recognized by the pancreas as sugar. Hypoglycemia is a stress symptom. This causes potassium to be excreted in the urine and salt to be retained, contributing to hypertension. Adelle Davis suggests that the unpleasant feelings of hypoglycemia may be relieved by taking potassium chloride tablets. Avocado contains an odd sugar called mannoheptulose, which may actually depress insulin production. Apart from avocado there are many other herbs that can help regulate blood sugar levels. See Herbal Remedies for Diabetes and Hypoglycemia. An another plant-based supplement called Pycnogenol, derived from Pine Bark, has recently emerged in scientific literature that may help to ameliorate some of the medical conditions associated with pre- and/or diabetic insulin resistance such cardiovascular diseases or cognitive dysfunctions and many others. It is suggested to discuss this with your medical health professional. See: PubMed Studies. As described previously, hypoglycemia means low blood sugar level. This is the common term used by people who suffer from the hypoglycemic symptoms. Unfortunately, this term causes immediate confusion for conventional doctors who understand hypoglycemia to be low blood sugar occurring in diabetic patients who have accidentally overdosed with their insulin injections. However, if we consider the condition in terms of insulin resistance the difference between diabetes and hypoglycemia is one of degree. In diabetes we have high blood sugar concentrations, whereas in hypoglycemia we see wildly fluctuating sugar levels, depending on the severity of insulin resistance. If you want to research hypoglycemia in the medical scientific literature, you have to look for terms like hyperinsulinism, hyperglycemia, insulin resistance, Syndrome X, diabetes and so on. Many nutritional doctors use the term Dysglycemia. It is possible that in the near future the medical fraternity may agree on a term. See also: Hypoglycemia: an unnamed medical condition There is no doubt that the impact of hypoglycemia is underestimated by the community. There are studies to show that hypoglycemia is associated with a vast array of modern degenerative diseases, from atherosclerosis, arthritis, various bone diseases, heart diseases, in fact every organ found in the body. And there is much evidence that hypoglycemia is a factor in mental illnesses, not generally recognized by conventional medicine or psychology. See Research Evidence. This condition is one of sensitivity to yeast in the diet occurring in foods such as bread, alcohol, mushroom and malt, as well as to yeast germs which normally live in the intestines, particularly candida albicans. Approximately 25 percent of hypoglycemic patients suffer with candidiasis. The symptoms are almost identical and are mainly tiredness, vagueness, poor concentration, poor memory and depression. People with candidiasis need to follow the rules recommended for hypoglycemics but must also avoid yeast foods and in most cases do better with antifungal agents such as Nystatin prescribed by the doctor as well as acidophilus capsules obtainable from health food stores. Other names include ME or myalgic encephalomyelitis or the yuppie flu. Severe fatigue is a common feature of CFS. This disease is becoming more common and many doctors regard it as predominantly a psychological condition. Some of the sufferers do have hypoglycemia and candidiasis and these can be treated mainly with diet and supplements. Dr Samra and other doctors regard this condition as a weakness of the immune system which has developed as a consequence of modern medicine as well as environmental pollution. Defying Darwin’s laws of nature, these days even people with weak constitutions live to become adults and do reproduce. This is one theory; others include the development of CFS as a result of exposure to antibiotics over some years. Again others believe the disorder has resulted from pollutants in the environment, including petrochemicals, lead, mercury and even fluoride in our drinking water. One obvious reason for the development of hypoglycemia and diabetes is our modern lifestyle with easy access to manufactured foods laden with sugar. 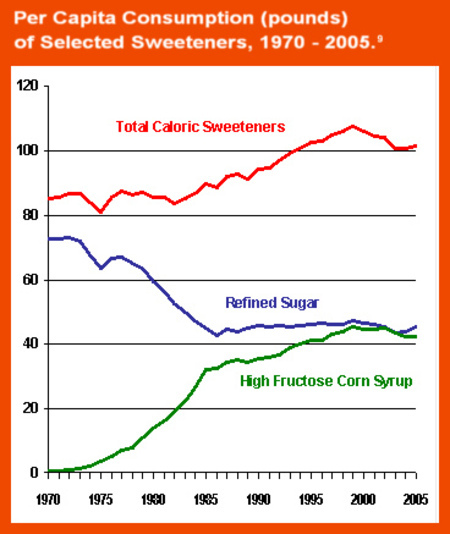 Our sugar consumption has increased exponentially over the last sixty years. See: World sugar Consumption and here and here. Much of it is promoted by the fast food industry. Sugar is addictive and helps to boost the sale of food products. See: The Serotonin Connection But there is another mechanism that may have contributed to excess sugar consumption. Studies have shown that psychological stress produces stress hormones, such as cortisol and adrenaline, that may interfere with the synthesis of a neurotransmitter, serotonin. This is called environmental depression. This is why we have included a self-help PSYCHOTHERAPYcourse, that will help people deal with stress in a more effective way. Serotonin is the main ‘feel-good’ neurotransmitter in the brain. An imbalance of serotonin in the brain can cause endogenous depression. Doctors usually prescribe Selective Serotonin Reuptake Inhibitors (SSRIs) for endogenous depression. These drugs are said to increase serotonin by blocking its reabsorption in the brain and so may reduce depression. The nexus between hypoglycemia and mood disorders is that hypoglycemia interferes with the production of biological energy called adenosine triphosphate (ATP) that is essential in the synthesis of feel good neurotransmitters. Without that energy the body cannot produce these neurotransmitters. The body produces serotonin from tryptophan, an essential amino acid (protein unit) found in food, such as soya protein, cottage cheese milk and many others. See Rich Sources of Nutrients at the web site. The absorption of tryptophan from food has to compete with the absorption and digestion of other amino acids – such as phenylalanine. Most amino acids (including glucose) – but not tryptophan – are transported into cells for utilization via the action of insulin! The absorption of tryptophan for conversion to serotonin can be sped up by consuming refined carbohydrates, such as sugar. Increased sugar consumption has the effect of triggering the release of insulin from the pancreas. This helps to absorb all the amino acids (including glucose) – but not tryptophan – leaving tryptophan free for absorption. Unfortunately, people who are depressed may be inclined to increase their sugar consumption. This will speed up absorption of tryptophan for conversion to serotonin with the help of vitamin B6 and magnesium and presto they feel happy!!! But this may precisely lead to ‘sugar addiction’ and hypoglycemia! Many depressed people, including those with an addiction problem have been found to have a history of sugar-addiction. A high sugar diet, however, will cause the body to ‘down-regulate’ receptors for insulin in the membranes of cells. This means the cells will fail to respond to normal levels of insulin and eventually show “insulin resistance”. The body will try to compensate for this through what is called the hypothalamic-pituitary-adrenal axis (the HPA axis). This means in response to the perceived energy starvation by the hypothalamus in the brain, a message is sent to the adrenal glands to secrete adrenaline into the blood stream. This hormone functions to convert glycogen stores in the liver and muscles into glucose, so as to quickly raise blood glucose levels. But adrenaline is also the fight/flight hormone readying the body to face the dangers of life by pumping energy into muscles and the brain. This panic hormone is also responsible for the myriad of hypoglycemic symptoms, such as tremble, shakes, mood swings, depression and confusion. Some people have learned that taking sedating drugs such as alcohol, marijuana or benzodiazepines will temporarily give relief to these symptoms. But these can lead to addiction. See: The Serotonin Connection. So we see that there is more to hypoglycemia than meets the eye. Please feel free to use the What is Hypoglycemia? flyer. Send it to your doctor, counsellor, or other health care worker or to friends. Perhaps you may wish to use it for your local Discussion Group Meetings and/or Community Health Centre. The flyer is design for a single A4 sheet paper, printed on both sides and then folded in half. Brighthope, Ian(1990), FIGHTING FATIGUE,McCulloch Publishing, North Carlton Vic. Budd, M.L. (1981), LOW BLOOD SUGAR (HYPOGLYCEMIA), Thorsons publishers Ltd.
Buist,Robert, (1984), FOOD INTOLERANCE: What it is & how to cope with it, Harper & Row, Pubs., Sydney. Buist,Robert, (1986), FOOD CHEMICAL SENSITIVITY: What it is & how to cope with it, Harper & Row Pubs., Sydney Cheraskin,E. & Ringsdorf,W.M. (1974), PSYCHO-DIETETICS, Bantam Books. Coca,A. (1956), THE PULSE TEST, Arco,N.Y. Davis,Adelle(1979), LET’S GET WELL, Unwin Paperbacks, Sydney. Dufty,William(1975), SUGAR BLUES, Warner Books, Inc.N.Y. Eagle,Robert(1979), EATING AND ALLERGY, Futura Pubs.Ltd. Camberwell. Feingold,B. (1975), WHY YOUR CHILD IS HYPERACTIVE, Random House, N.Y.
Forman,Robert(PH.D.)(1979), HOW TO CONTROL YOUR ALLERGIES, Larchmont. Fredericks,C. & Goodman,H. (1969), LOW BLOOD SUGAR AND YOU, Constellation International. Hoffer,A. & Walker,M. (1978), ORTHOMOLECULAR NUTRITION, Keats Pub.Inc. New Canaan, Connecticut. Hurdle,J.F. (1970), LOW BLOOD SUGAR:A DOCTOR’S GUIDE TO ITS EFFECTIVE CONTROL, Parker Publishers. Lesser,Michael(1980), NUTRITION AND VITAMIN THERAPY, Bantam Books. Ludeman (1979), DO IT YOURSELF ALLERGY ANALYSIS HANDBOOK, Keats Publishing, Inc.
Mackarness, R.(1976), NOT ALL IN THE MIND, Pan, London. Mindell, Earl (1979), THE VITAMIN BIBLE, Guild Publishing, London. Null,G. & S.(1978), THE NEW VEGETARIAN, A Delta Book Dell Pub.Co.Inc.N.Y. Pfeiffer,C.C. (1978), ZINC AND OTHER MICRO-NUTRIENTS, Keats Publishing Inc. New Canaan, Connecticut. Philpott,W.H. & Kalita,D.K. (1980), BRAIN ALLERGIES, Keats Publishing Inc. New Canaan,Connecticut. Plesman, J. (1986), GETTING OFF THE HOOK, Second Back Row Press, Katoomba. Randolph, T.G. (1962), HUMAN ECOLOGY AND SUSCEPTIBILITY TO CHEMICAL ENVIRONMENT, Thomas, Springfield. Randolph,T. & Moss, R.W. (1980), ALLERGIES – YOUR HIDDEN ENEMY, U.K.
Samra,George(1984), THE HYPOGLYCEMIC CONNECTION, M.I.N.T., Sydney. Schauss, A.G.(1980), DIET, CRIME AND DELINQUENCY, Parker House,Berkeley,Cal. Turnstone Press Ltd. Ross,H.M. (1975), FIGHTING DEPRESSION, Larchmont Books N.Y.
Vayda,William(1981), HEALTH FOR LIFE, Sphere Books, New Century Press Pty. Ltd., Sydney. Williams,Roger J. (1971), NUTRITION AGAINST DISEASE, A Bantam Book. Williams,Roger J. & Kalita Dwight,K. (Eds)(1977), A PHYSICIAN’S HANDBOOK ON ORTHOMOLECULAR MEDICINE, Keats Pub.Inc.,New Canaan, Conn. Thank you for your information re hypoglycemia. I was diagnosed with type 3 hypoglycemia when I was 29 having lived with it all my life. Now 40 years down the track many doctors still do not understand it. My doctor who diagnosed it has now retired which leaves me in a bit of a pickle trying to explain what it is and that it was a 4 hr GTT that showed I had type 3. Now it is playing up. I feel I need to return to the various vitamins and minerals you have suggested. Excellent article on the topic of hypoglycemia. Really extensive it should be said. I particularly like the link between hypoglycemia and mental health. Something that us, doctors, tend to not consider. It would be interesting to research the incidence of type 2 diabetes in people with moderate to severe depression. I suspect it will be a fairly reasonable percentage considering the zinc/copper ratio angle you mentioned. Just to add, there are some other causes of hypoglycemia mentioned in the article https://thedrjoe.com/do-non-diabetics-get-hypoglycemia/ that may also need to be considered especially adrenal issues. Good job! 85% of prisoners are drug addicts and if you add others – for instance people with uncontrollable anger outbursts – there are in fact few criminals in jail, because the majority of them suffer from some sort of mood disorders and are physically ill. Thank you this is exactly the information I was trying to find to confirm my own analysis of what’s going on with my menopausal hot flashes. If you have an article that ties in menopause that would be great! I have fibro symptoms also, am prediabetic, although my A1C got into normal range now after two months on a low sugar and low carb plan. With my flashes my heart rate was so high, night sweats unbearable. Last week I ate some gelato and had heart palpitations and HR of 100 for 3 hrs! I learned my lesson. I also had a GTT recently which showed insulin spiked to 106 then 84 then back up to 96 by the two hour mark, and glucose was at 92. Fasting insulin was 10. I find that if I eat any simple carbs or sweet, within minutes I will have a hot flash. So would you agree that what could be happening is that I have an immediate hyperinsulin response which then causes low blood sugar for a few minutes triggering the hot flash and high HR, then after that my blood sugar will go high? Because the insulin resistance doesn’t allow the glucose into the cells? Why does it get into the cells enough to go low with the initial high insulin spike? And this lack of glucose inside the cells can cause the fibro muscle and tendon pain also since the glucose is circulating but not getting into the cells. How does estrogen factor? I also have very low body temp (much lower with menopause) and hypothyroid which is managed so all the levels are ok. Thanks! When you have insulin resistance your cells are not responding to the available insulin. It has been overexposed in the past to too much insulin. Hence your body will defend itself by producing greater amounts of insulin which causes HYPERINSULINISM, or too much insulin. This will cause your glucose levels to drop too low and cause hypoglycemic symptoms. If you want to investigate alternative methods of stabilising your insulin levels I suggest you do your own research at Research Index at: https://docs.google.com/document/pub?id=1sKYIT2wfJquvtHQNuCGRp78eeuOFE915cw9-cWhCVLw and discuss with doctor. There are many herbs among others that can stabilze sugar levels,. Have you heard of dr. Joseph Krafts work on insulin assays? It might change your mind on the importance of also testing insulin with the GTT. He did over 15000 assays that were for 5 hrs and found 4 irregular patterns and only one normal pattern. Very interesting! We have used Dr George Samra’s GTT for years to test for Hypoglycemia, with great success. Thanks so much for this article it’s an interesting read. I was diagnosed with breast cancer in 2015 and since having chemo and radiotherapy i now have severe instant reactions to all sugars and refined carbs almost like an allergy. I get pretty much all symptoms of hypoglycemia including the low blood sugar levels. Sometimes my levels aren’t affected but i still get the symptoms. I was told it was reactive hypoglycemia. GTT was 2.5mmol. I am now starting to get these symptoms regardless of whether ive eaten or not. I avoid all sugars and refined carbs and I’m non diabetic. Any advise would be appreciated. Thank you so very much for this article! I want to send it to every medical professional I have ever met in relation to this illness! I am a 33 year old female and ex-natural bodybuilder, who trained for 16 years up until 2 years ago. I have self-diagnosed Reactive Hypoglycemia. I have had this for 7 years and this year was diagnosed with CFS. I do not accept this label and have read the opinion that CFS/M.E is likely just a symptom of a separate illness…makes sense. My RH has been horrific and I experience a wide range symptoms (blood sugar crashes) on a daily basis. I now suffer with daily exhaustion and cannot work or train any more. I just do my own yoga at home. I have seen more doctors (conventional and complementary) than I can count and received no firm diagnosis or support (this latter point is a real killer). I have just returned to a strict diet of high protein and fats, with low carbs. It does help, but is extremely tough, as I have a list of intolerances as long as my arm and it means obsessing over food. I have Multiple Chemical Sensitivities also. Privately paid for lab tests showed up a level of mitochondrial dysfunction and the fact that I have no growth of lactobacillus acidophilus in my gut, but these tests are not recognised by doctors of conventional medicine, of course. I am pretty much obsessed with reading articles from the net, as I can imagine most of you are and simply cannot accept that this is me for life. 7+ years on, it is now affecting me psychologically. My physical strength somehow gave me mental strength. Now I have to face my psyche. Anyway, apologies for telling my life story as I realise this is not a forum for the like. I just couldnt stop typing..
Hi. I have exactly the same issue as you. Its taken over my life. I have been diagnosed with pyroluria which can have many symptoms including hypoglycemia . Not recognised by conventional doctors though, a good naturopath will help you.